Better Transit YXE is part of a coalition of organizations and individuals who are launching a “Ten Days for Transit” campaign. The video below follows City Councillor Charlie Clark and Eaglefeather News publisher John Lagimodiere as they ask Saskatoon citizens about their bus stories and take a ride with City Manager Murray Totland and engineer Marc Bourassa to discuss the role of public transit in a growing city. Currently, less than 5 per-cent of the 257,000 people in Saskatoon use public transit as their main form of transportation. 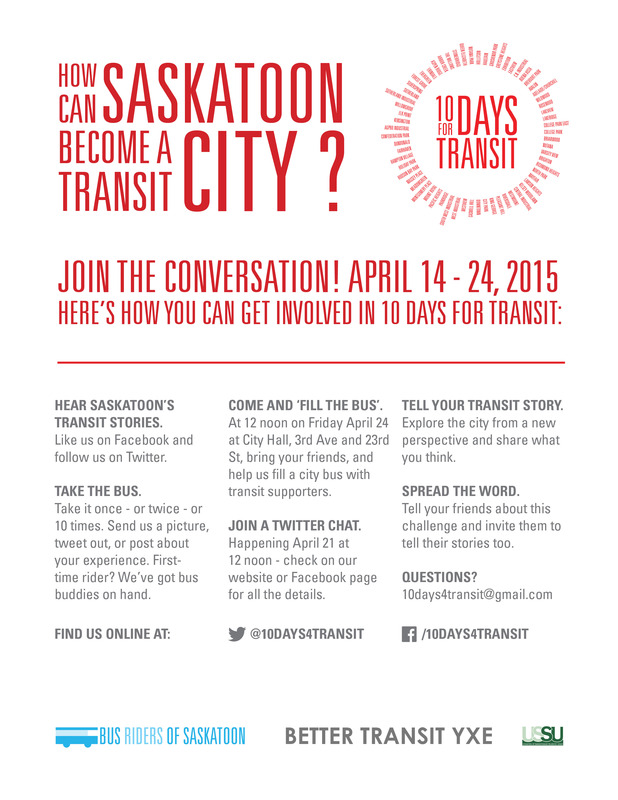 During the 10 Days, April 14th to 24th, bus riders will be on the news and on social media discussing how Saskatoon can become a transit city and will encourage others to try out the bus. The coalition also includes Bus Riders of Saskatoon, University of Saskatchewan Students’ Union, Downtown Business Improvement District (The Partnership), and interested individuals. ← Where Does Your Mind Wander When Your On Transit?